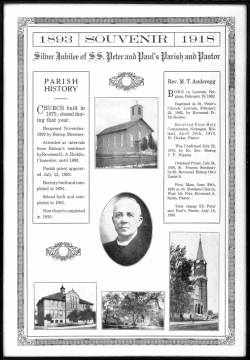 Saints Peter & Paul Catholic Church is a parish of the Catholic Diocese of Green Bay, and is located at the intersection of University Avenue and Baird Street, on the Northeast Side of Green Bay, Wisconsin. Originally a parish made up almost entirely of people of Belgian ancestry, today we are a diverse parish, including two major language groups; English and Spanish, and people of many ethnic and racial backgrounds. We rejoice in this diversity, as we manifest the universal nature of our Catholic Faith.